On April 24th, Governor Scott Walker announced that a 21-acre parcel of land in Eagle River has been designated as a Certified In Wisconsin® development-ready site, a move aimed at attracting corporate development projects to the city. The site, owned by Ruedebusch Development and located near County Highway G and Highway 45 in Vilas County, is the state's 20th Certified Site. The Certified In Wisconsin designation gives site selectors and business owners confidence that building plans will not be held up by costly delays in permitting and approvals. "When it comes to attracting new businesses to Wisconsin, it's important that we utilize initiatives like the Certified In Wisconsin Program to give us a competitive advantage over other states," said Governor Walker, who announced the designation at an event in Eagle River. "Since this program was created, there have been 21 projects developed on our Certified Sites by companies planning to create more than 2,200 jobs. We're looking forward to that same type of success in Eagle River." "In the construction and development industry, site due diligence is a key component to any project," said Carl Ruedebusch, president and CEO of Ruedebusch Development. "I believe strongly in the Certified In Wisconsin Program and know the work completed to certify this site as development-ready eliminates hurdles, provides a clear path to construction and complements the many great assets in Eagle River." Located two miles north of downtown Eagle River, the site is less than five minutes away from the Eagle River Union Airport, Northland Pines High School, the World Championship Derby Track and Ascension Eagle River Hospital. All utilities are at the lot line, including electric, natural gas, water, sanitary sewer, telecom and internet. A snowmobile/ATV recreation trail runs along the western boundary of the site, providing direct access to year-round activities and alternative modes of employee transportation. "The City of Eagle River is excited to be home to the newest Certified In Wisconsin site," said Eagle River Mayor Jeffrey Hyslop. "Adding a Certified Site to the area is a distinctive feature and we look forward to welcoming future businesses to the city." 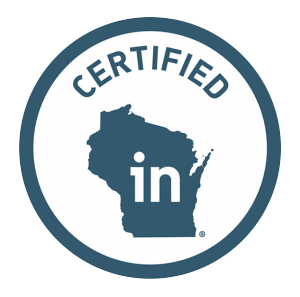 The Certified In Wisconsin Program, which is overseen by the Wisconsin Economic Development Corporation (WEDC), provides potential tenants with all the information needed to make quick decisions about whether that site is right for their needs, such as utility and transportation infrastructure, environmental assessments, quality of available labor force and more. WEDC has utilized Deloitte Consulting to help evaluate potential Certified Sites. WEDC markets each Certified Site through its Locate In Wisconsin website. WEDC administers the Certified In Wisconsin Program to enhance Wisconsin's appeal to companies looking to expand operations or locate within the state. Working with WEDC, communities can obtain site certification for properties at a much lower cost than they would pay to pursue the designation on their own through an independent consultant. This is the third Certified In Wisconsin site being developed by Ruedebusch Development. The company also has sites in Dane County - the Fitchburg Technology Park, which was one of the first Certified Sites in the state, and the North Mendota Energy and Technology Park in Westport. The Fitchburg site is home to a $30 million manufacturing facility being constructed by Promega Corp., a major Madison-area biotechnology company. "I applaud Carl for his continued support of the Certified In Wisconsin Program, and congratulate him on earning this designation for the Eagle River site, which is our first Certified Site in northern Wisconsin," said Mark R. Hogan, secretary and CEO of WEDC. "This certification is a significant economic development tool that will help attract new development and create jobs in the Northwoods." The other Certified in Wisconsin Sites include: Beaver Dam, Beloit, Black River Falls, Fitchburg, Green Bay, Howard, Menomonie, Sparta, Stevens Point, Wausau, Verona, West Bend, Westport, Whitewater and Wisconsin Rapids. For more information about the Eagle River Certified Site, visit the website.